Critics said she showed poor sportsmanship. Canada's Jocelyne Larocque, second from right, holds her silver medal after losing to the U.S in the women's gold medal hockey game at the Winter Olympics in Gangneung, South Korea on Feb. 22, 2018. For Jocelyne Larocque, the only thing that glitters is Olympic gold. Anything else — especially a second-place medal after a devastating loss to Canada's nemesis — just wouldn't do. At least that was the sentiment on Thursday, after the Canadian women's hockey team lost the Winter Olympics final against the U.S. The defeat — a heart-stopping shootout that ended 3-2 — halted the Canadian team's streak of four consecutive gold medals and lifted the Americans to the top of the podium for the first time since 1998. After the game, Canada's athletes stood solemnly as silver medals were placed around their necks. Larocque almost immediately took hers off and held it in her hand instead. The move caught the eyes of U.S. fans in the audience, who yelled, "Put your medal on!" according to the Globe and Mail. Eventually, an official from the International Ice Hockey Federation intervened. He told Larocque there were "legal" reasons she couldn't refuse to wear her silver medal. "We were going for gold," Larocque told the paper, adding that the silver medal will feel like a consolation after "we reflect." Larocque would apologize on Friday to the IOC, International Ice Hockey Federation, the Pyeongchang Olympic Organizing Committee, the Canadian Olympic Committee, Hockey Canada and her teammates and fans. "I'm proud of our team, and proud to be counted among the Canadian athletes who have won medals at these Games," she said. "Being on the podium at the world's biggest sporting event is a great achievement and one that I'm thankful I was able to experience with my teammates." "I take seriously being a role model to young girls and representing our country," she said. "My actions did not demonstrate the values our team, myself and my family live and for that I am truly sorry." 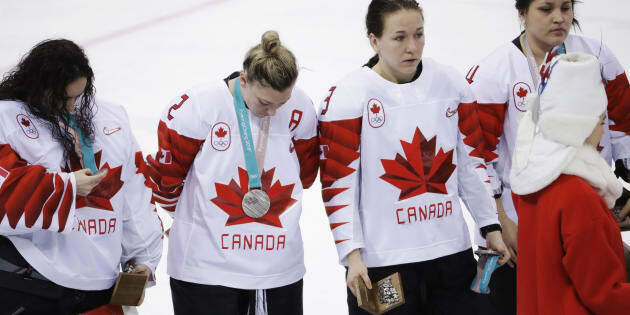 Her teammates may have kept their medals on, but to say there was any elation over the outcome would be a gross exaggeration, as many of Canada's players were in tears. Team Canada players react after losing the women's hockey gold medal game against the U.S. at the Winter Olympics in South Korea on Feb. 22, 2018. On social media, the reaction to Larocque's refusal to wear the medal was split. Many on Twitter berated the move, arguing it showed she was a "poor sport." At one point, her Wikipedia page was briefly edited so that her position was changed to "sore loser." @HC_Women very disappointed in Jocelyne Larocque's display of incredibly un-Canadian sportsmanship and being a poor loser. Taking off her medal immediately after being presented with it. Others were a bit more sympathetic, arguing that the Olympic loss wasn't an ordinary one. An Olympic defeat at the hands of the Americans is particularly stinging, too, according to head coach Laura Schuler. She experienced it as a player for Canada when women's hockey made its Olympic debut in 1998. "I don't think it ever goes away," Schuler said after Thursday's game. "There's always a part of you inside that [feels] it's hard, because you feel you let your country down, but at the same time when you look at it from a bigger picture, a global picture, there's positive in it."